Wind farms must be properly sited if they are to achieve their goals. Failure to accompany the large amounts of public money devoted to these projects with any siting restrictions has begun to sour the public's enthusiasm for wind power. As complaints mount in communities hosting wind farms too close to homes, local officials and even state regulators are increasingly rejecting the projects. This shift in public opinion about this type of "renewable energy" is also motivated by increasing awareness that wind farms generate a small fraction of their "capacity" and require polluting fossil fuel power plants for backup whenver they fail to run. New York State promotes wind energy projects under a state policy to increase to 30% New York's reliance on renewable energy production. New York hydropower already provides 19% of our electricity from renewables. A dozen wind farms are now operating in New York, have driven up the cost of electricity, and have yet to produce even 1% of the state's electricity demand. 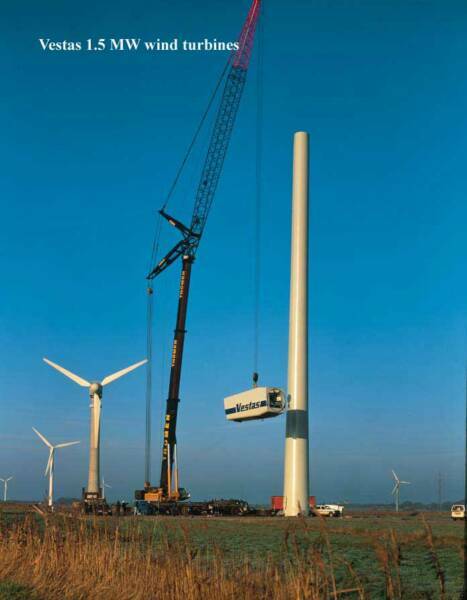 A wind power plant (not a small wind turbine) involves dozens of industrial wind turbines, each with an access road sturdy enough to accommodate a 500-ton crane to construct the turbine. To get the crane and other heavy equipment to a single turbine site requires clearing many acres. (See image.) Also required are miles of new transmission lines, either underground or above ground. In sharp contrast to conventional power plants, wind power plants require a large project area, well over a dozen square miles. This often takes about half the land area of a rural town. Development of a wind power plant can change drainage patterns and diminish water quality by silting up creeks, ponds and wetlands. Criss-crossing the countryside with access roads and transmission lines can fragment habitat and divert wildlife populations away from the area. 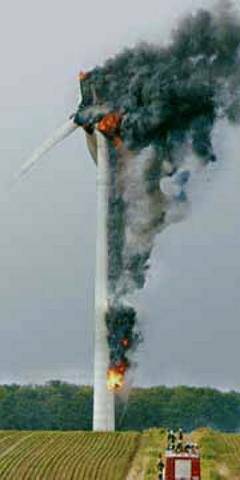 Operation of wind turbines kills birds and bats. The visual and noise impacts of wind turbines can diminish property values, offsetting gains to the host town by decreasing its property tax base. This can change the character of the community, which New York counts as an environmental effect. However, no state plan or comprehensive regulation for wind farms in New York exists. This encourages wind energy developers to take advantage of rural towns on whose shoulders land use regulation falls. A 60-turbine wind farm using 1.5 Megawatt turbines has a 90-MW theoretical capacity, but the wind farm will achieve that output only when optimum wind speeds at turbine height occur. According to a 2005 report to NYSERDA by GE Energy (p. 33) industrial wind plants in New York have effective operating capacities of 10% because they fail to operate "in line with the load demand." A 2006 report by Ontario, Canada's Independent Electricity System Operator (p. 12.n) agrees ("wind generation has a dependable capacity contribution of 10%"). Electricity load demand is highest in the summer and during daytime, but wind turbines operate the least during those times. Peak operations for wind turbines occur during the night and in the winter. Thus, a land-based 60-turbine wind farm can be expected to generate about 9 MW on average of the course of any given year in New York. However, on any day, one wind farm can surge from zero to 2,000 MW and back. This imposes new costs on electric ratepayers. Storage of wind energy would need to be available at a gigawatt-hour scale, is at least decades away, and may never be realistic. 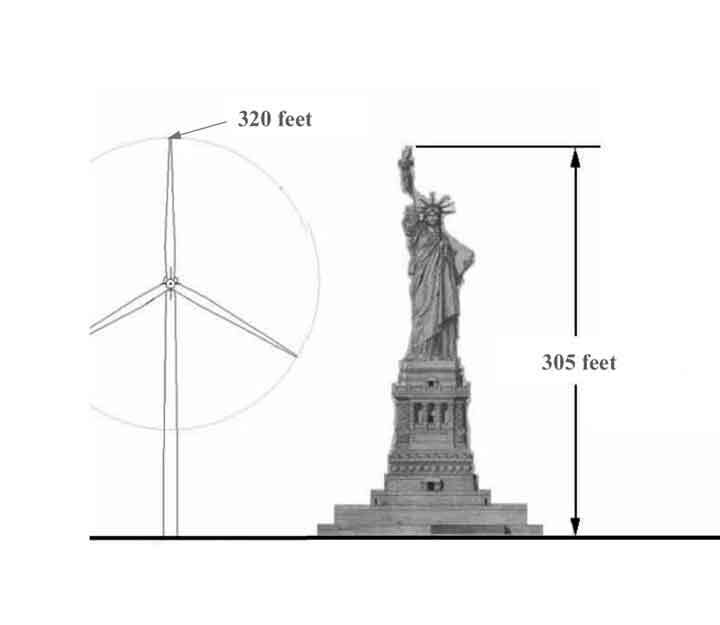 In New York and other states the grid operator is required by law to accept wind energy interconnections and manage the on-again off-again nature of wind energy. As government policies promote more and more wind farms, grid operators have expressed concern that transmission systems will be unable to manage the surge and decline of wind-generated electricity, leading to more frequent local power outages. Grid operators also say revving thermal power plants up and down to accommodate wind energy mean more emissions, so “the actual emissions reduction rates from wind are far less than what the lobbyists are touting.” Displacing greenhouse gases, of course, is one of the primary purposes of wind energy. The cost to avoid 1 tonne of CO2-equivalent emissions per MWh with wind power is $830 to $1149 compared with $22 with nuclear power. In 2009 New York's Public Service Commission issued an order requiring new wind farms to prove their electricity will not just displace hydroelectric power, other wind power on the grid, or low-emissions gas-fired power plants. Under PSC's Article 10 power plant siting regulations, adopted on July 10, 2012, new wind farms with 25 MW of design capacity or more will be required to demonstrate they will actually deliver the electricity they generate. Conventional power plants must keep running to provide electricity when the wind won't. This is because electricity must be used instantaneously, so grid operators are constantly "balancing" load to meet supply and demand. When some electricity generators go down, the grid operator must call others up. Acknowledging this fact, the National Academy of Sciences estimates that, at maximum build-out in the future, wind can displace no more than 4.5% of fossil-fuel-fired power plant CO2 emissions, and "less than 2.25%" of CO2 emissions from all sources in the U.S. by 2020. In its Wind Report 2005 (p. 10), Germany's grid operator (and wind farm developer) E.On Netz estimates that by 2020 wind can displace no more than 4% of fossil-fuel-fired power plant CO2 emissions. U.S. Interior Secretary Ken Salazar says wind power can replace "about 3,000 medium-sized coal-fired power plants," but FactCheck.org finds that claim to be "far-fetched" and "wildly optimistic, to say the least." That's because wind power can't provide steady power like coal-fired power plants. The more wind plants are built, the more backup power plants must be built, severely reducing the emissions reductions and other environmental benefits we thought wind plants would provide. China has found that aggressive wind development requires more coal-fired power plants for backup, not less. Jonathan Cogan of the Department of Energy told FactCheck.org: "You couldn’t really, just by themselves, replace a steady baseload supply like coal-fired or nuclear plants with an intermittent supply" such as wind turbines. An important article in the German publication Spiegel Online suggests (with some exaggeration) that commercial wind energy in Europe has not reduced CO2 emissions "by one gram," principally because Europe's cap-and-trade system allows carbon credits for wind to be sold to coal-fired power plants, increasing coal plants' CO2 more than what was planned. Thus whether wind energy can achieve its primary mission, to meaningfully affect climate change, remains an open question. On a per-unit of generated electricity, wind farms are the largest beneficiaries of federal energy subsidies. Wind farms rely on (1) federal and state income tax credits for the cost of purchasing and installing a wind power plant; (2) state "Renewable Portfolio Standards," which require utilities to purchase a substantial portion of their electricity from renewable regardless of the cost; (3) local property tax exemptions; (4) a five-year depreciation for all equipment; and (5) state sales taxes exemptions. The federal five-year depreciation tax credit will generally pay for the full cost of constructing a wind farm. Tax credits include the controversial federal Production Tax Credit (PTC) which pays wind companies 2.1 cents per kw for a ten-year period, for electricity generated. 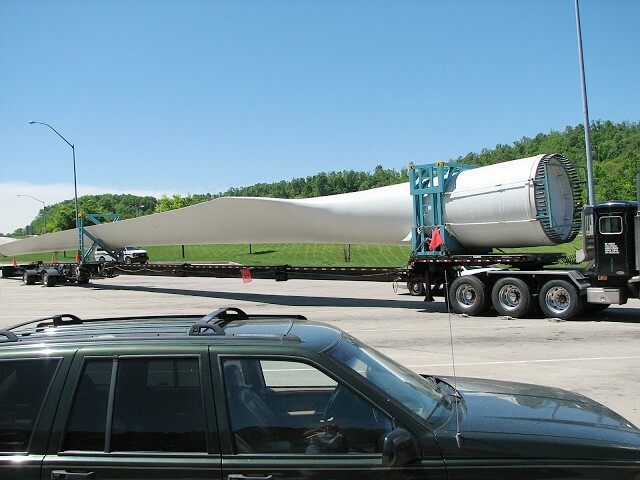 The 2009 Stimulus Bill allowed wind farm operators to choose between the PTC and a check from U.S. Treasury for 30% of the cost of the project. This will cost the U.S. billions for years to come. The PTC was renewed for one more year under the "fiscal cliff" deal, but with a change that will also extend for many more years the billions we pay: now projects need only commence construction by the end of 2013, not just commence operations as previously. Wind power plants cannot survive on electricity sales alone. So dependent is the wind industry on the PTC that each time it was not renewed, in 1999, 2001 and 2003, new installed wind capacity declined 93, 73 and 77 percent, respectively. New York State gives wind energy companies even more. The state Renewable Portfolio Standard requires regional utilities to pay renewable energy sources connected to the grid. The added cost is passed on to ratepayers. On top of this, NYSERDA collects a surcharge imposed on household utility payments called the System Benefits Charge. NYSERDA uses the SBC payments to provide millions in grants for wind farms, some $175 million per year. (See also NYSERDA's recently signed contracts.) Economic Development Zone benefits for wind farms have meant the loss of millions in state revenues. (But see sidebar.) And by sponsoring wind farms, county Industrial Development Corporations make the projects exempt from local property and sales taxes for the first 15 years of operation, return for a payment-in-lieu-of-taxes worth about one-fourth what they would otherwise pay. Finally, wind farms don't compete with other generators of electricity in the open market. Instead, they are guaranteed the wholesale price for the electricity they generate, whether it's needed or not. In many cases, because they operate mainly at night when demand is fully met be continuously operating power plants, wind energy is "spilled," or discharged without ever being used. And what does the town hosting such a plant get in return? Realtors in towns with these kind of wind plants report that property values of homes decline within sight of a battery of wind turbines. Because the turbines are often sited on ridge tops, the impact on home values extends many miles away. In some communities the wind energy company has had to buy homes of complaining homeowners and sell them at fire sale prices–its cheaper than a nuisance lawsuit. Neighboring landowners who don't sign an easement agreement can sue the company for allowing a nuisance. Local laws establishing setbacks less than a mile are therefore setting up their communities for divisive litigation. And understandably so, because the nuisance and safety impacts of a local law with inappropriate setbacks or buffer zones between wind turbines and homes should have been looked at in the first place. Health problems do not appear to be present where wind turbines are located at safe distances from homes. What's safe distance? A consensus is emerging among independent acoustic and health experts that it is at least two kilometers (1.24 miles). Town boards are being told by wind developers there is no need to look at potential negative impacts of noise standards and home setbacks until later, when an application is submitted for a wind plant. By then it's too late, because the applicant has achieved its main goal, a local law with setbacks that are short enough to accommodate the project, but too short to protect people, and noise limits of 50 decibels at the exterior wall of homes, too high to protect people's right to peace and quiet and sleep. Proponents of industrial wind plants point to the high decibel levels required to damage the ears (over 90 decibels), urging that noise from wind turbines is safe. However, chronic exposure to much lower noise levels is a recognized health problem. he World Health Organization recognized sleep disturbance as a serious health impact. To avoid sleep disturbance, WHO recommends nighttime limits for noise be no higher than 30 dB(A) in bedrooms. Ontario, Canada, has imposed a limit of 40 dB(A) at residential property lines on noise from wind turbines, but that has not been sufficient to stop complaints. Most towns in NY are adopting local laws recommended by the wind industry and NYSERDA with a limit of 50 dB(A). NY Department of Environmental Conservation has guidelines on assessing noise impacts that state (at p. 15) increased sound levels of 6 decibels will cause community complaints, and an increase of 20 decibels is "intolerable." The existing background nighttime sound level in most rural areas is about 25 dB(A), often lower. Operating wind farms have been measured causing sustained sound levels in excess of 70 dB(A) well over 1,000 feet away. In western New York, wind companies ask local landowners to sign easement agreements that preclude any complaint by the landowner about noise, loss of hunting resources, intrusive "shadow flicker" caused when the blades catch the sun, and damages from wind turbines leaking oil or throwing ice hundreds of feet at high velocity. At the same time, these companies are telling town boards and planning boards that wind turbines are quiet and safe. See our resource sheet, "Understanding noise impacts from industrial wind farms"
Canadian & American Wind Energy Associations, critique of vibroacoustic disease (2009) - noting that the scientific jury is still out on the link between direct organic impairments and exposure to wind turbine noise (the focus of Dr. Pierpont’s work), called vibroacoustic disease or wind turbine syndrome, this report overlooks well-established findings of health effects resulting from chronic sleeplessness, caused by mere annoyance with wind turbine noise at sound levels that are unlikely to result in vibroacoustic disease. Eagle, NY (Noble Bliss Windpark), sound from 1500 ft.
Actual generation rates for wind farms are available on the website of the Federal Energy Regulatory Commission (FERC). The data shows no wind farm in New York has achieved a 30% generation rate, compared to its rated or "installed" capacity, and most produce slightly above or below 20%. Jon Boone, "The Wayward Wind," June 19, 2006 --Good discussion of "capacity factor" (the actual electricity we can expect commercial wind plants to generate) and the high cost of public subsidies for commercial wind, focused on Noble Environmental Power's Bliss Windpark project in Wyoming County. Turbine manufacturer GE Energy reports that while utility-scale wind turbines have a capacity of 30%, their effective capacity is 10% because most of their contribution to the electricity grid occurs during off-peak times (at night and in the winter) when it's not needed. State utility grid operators are complaining about wind integration costs: Wind energy companies generally don't pay the cost of balancing the grid to manage the on-again off-again nature of the wind. On July 10, 2012, New York's Public Service Commission (PSC) issued new regulations governing the siting of power plants, including wind farms. As a result, local permitting is preempted, although local bans on wind farms or zoning limits on where they can be sited should remain valid. Wind industry, municipalities and advocacy groups all commented vigorously on the draft regulations, but few changes were made. See PSC's responses to comments. Large quantities of cement are required to anchor industrial wind turbines; cement plants are among the largest sources of greenhouse gases (especially NOx and SO2) and emit into the air about 1.5 lbs. of mercury per ton of cement produced, and one ton of CO2 per ton of cement produced. In a decade or so, industrial wind turbines may be obsolete as more cost effective and less damaging renewables become available. Hot rock ("enhanced") geothermal energy can produce very reliable baseload capacity, and can operate 24 hours a day waste-free, virtually emissions-free. According to a recent MIT study, known Enhanced Geothermal resources in the U.S. have the potential to generate an astonishing 56,000 times the nation's energy needs, for slightly less cost per megawatt than wind. On a per-megawatt basis, the footprint of an enhanced geothermal plant is less than the footprint required for a nuclear plant. MIT study: 100,000 MW from enhanced geothermal systems can be achieved in the United States within 50 years with a modest, multiyear federal investment. U.S. Dept. of Energy offers $90 million over four years ($10.5 million in FY 2008) for development of enhanced geothermal systems. U.S. Dept. of Energy, National Renewable Energy Laboratory, "Geothermal—The Energy Under Our Feet Geothermal Resource Estimates for the United States" --shows New York's geothermal reserves are deeper than 3.7 miles. Geothermal 101: an overview of the various types of geothermal energy. Hot rocks in Earth's crust offer hope for clean energy, but beware of tremors, CBC News, August 7, 2007. An underrated climate solution, the Center for American Progress Action Fund, September 7, 2007. New report concludes improved technology key to achieving full potential of geothermal energy, Geothermal Energy Association, November 14, 2007. U.S. Department of Energy invests $30 million for geothermal energy exploration, Scienceline, March 18, 2008. The wind industry promotes a "state of the art" analysis of the impacts of wind farms on residential property values by Ben Hoen, sponsored by the U.S. Department of Energy. But so far every independent review of the study has found it to be highly misleading. Listed below are several critical reviews of the study; the first one listed includes a full copy of the Hoen analysis. Not everyone's happy in Bliss: now that Noble Environmental has put up 55 of 67 turbines in the Hamlet of Bliss (Wyoming Co.), some residents say the wind farm is more intrusive than they expected. Iowa State University Center for Agricultural Law and Taxation has a guide for landowners faced with an easement offer from a wind power company. At least a dozen New York towns have banned industrial-sized wind power plants (although allowing small turbines), including: Malone, Italy, Castile and Warsaw. Contact us if you'd like a copy of their local laws. Dr. Nina Pierpont: peer reviews of her research on "Wind Turbine Syndrome"
NY Times says "effective use of wind power on a wide scale is likely to remain a dream"
Gear problems shut down windmills in Lackawanna: New wind turbines installed last year don't work. Is Industrial Wind Useful for Anything? Well, yes! According to the Energy Information Administration (USDOE's research branch), Annual Energy Outlook 2009 (Table A17), wind energy's technological limits make it unlikely to generate much more than 1% of our future electrical energy needs. We could reduce many times more of our energy needs by directing subsidies to municipal, commercial and home energy reduction plans. EIA said in 2010 that industrial wind costs more than nuclear power. “Community wind” projects optimize local benefits, particularly for rural communities. Such projects involve small turbines and local ownership. More information can be obtained from Farmers' Legal Action Group. New York's largest coal-fired power plant, Niagara Mohawk's Huntley plant, has a 336 MW capacity and operates at about 80% capacity. The Indian Point 3 nuclear power plant has a capacity of 970 MW, the Fitzpatrick nuclear power plant is 820 MW, both operating at 90% capacity or better. Wind will not help us avoid dependence on foreign oil. Most of our electricity comes from coal-fired and nuclear plants; very little oil is burned to produce electricity. The U.S does not rely on foreign fuel imports for electricity. 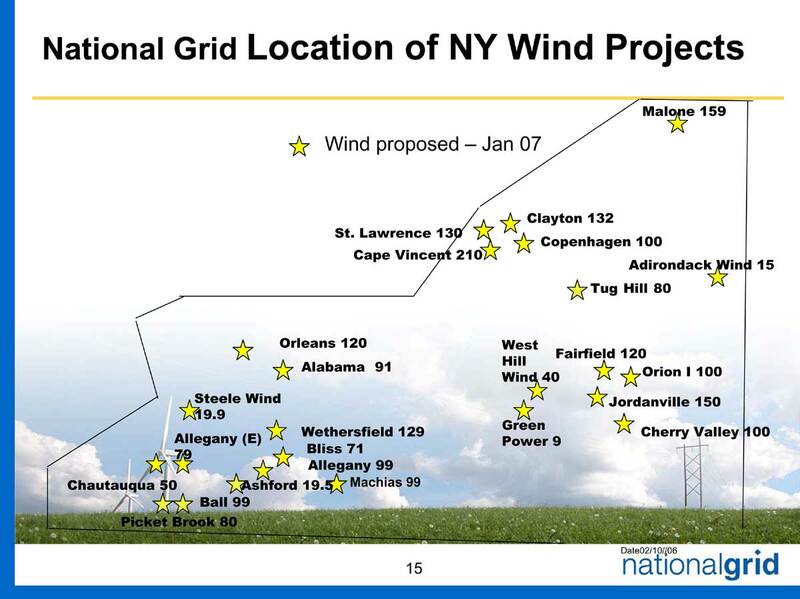 National Grid provides a map of utility scale wind projects proposed in NY for 2007. Savewesternny.org provides a more up-to-date map of project proposals in NY. Western New York and the North Country are targeted for the greatest concentration of new wind power plants. 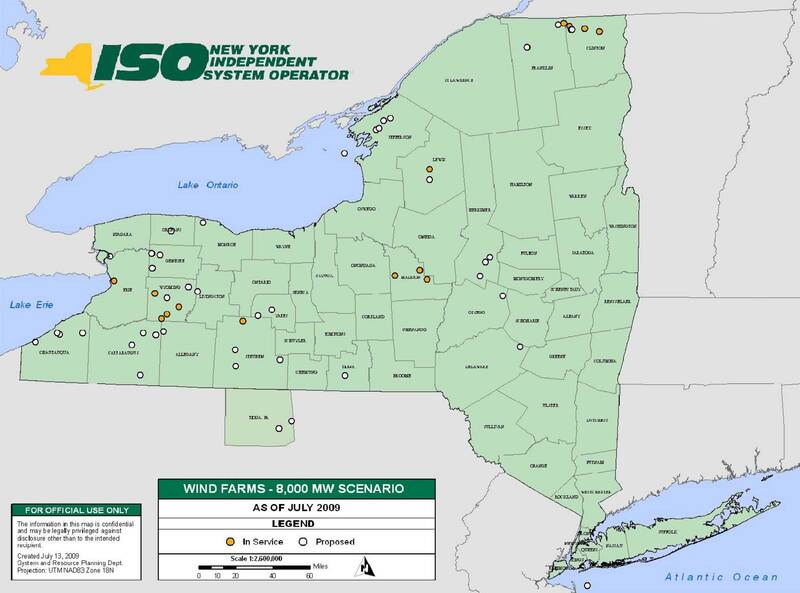 The New York State Independent Operator provides a list of electricity grid interconnection applications that includes about 100 wind plants pending as of August 28, 2007. The western New York Town of Bethany impaneled a very talented group of local residents to study "the possible ramifications of the placement of [commercial wind energy conversion systems] within the Town. The town used a 12-month moratorium, which it found necessary to extend by six more months, to allow the study committee to prepare a report on what they learned. The Report from the Bethany Wind Turbine Study Committee (2.2MB download) is a balanced, thoughtful analysis of pro's and con's. Every town should have such a committee. If they do, thanks to Bethany their committee can build on this work and add the findings of new research as it becomes available. The capacity factor is the ratio of actual energy produced in a given period of time (generally, annually) to the hypothetical maximum amount of energy that could be produced if the turbine was running full time at the rated power. The rated power of the turbine is the energy the turbine will produce per hour of operation, when running at its maximum performance ( i.e. at high wind speeds). "Net metering" is a policy requiring payment at the retail rate charged by utilities for electricity to alternative electricity generators that connect to the grid. New York's net metering policy applies only to "residential and farm service wind electric generating equipment owned or operated by a customer-generator." NY Public Service Law § 66-l(2) (2006). Industrial wind farms are paid at an "avoided cost" rate, the wholesale cost of electricity paid by utilities and grid operators. How much land is needed for a utility-scale wind plant? The American Wind Energy Association says 60 acres per installed megawatt. The Maple Ridge Wind Farm comes close: 195 turbines rated at 1.65 MW each (321.75 MW) has a project area of 21,000 acres (32.8 sq. mi. ), or slightly greater than AWEA's prediction of 19,305 acres. However, the Allegany Windpark proposed by Noble Environmental Power for Rushford and Centerville would have 67 turbines rated at 1.5 MW each (100.5 MW), with a project area of 15,360 acres (24 sq. mi. ), more than double AWEA's prediction of 6,030 acres. Machine Design magazine has editorialized that wind power is unable to make a meaningful contribution to electricity needs. "In the current interconnection process, the generator developer applies to the transmission provider for an interconnection after identifying a proposed site. The transmission provider must then perform a system impact study to determine what interconnection facilities and system upgrades would be necessary to connect that generator to the electric system. To manage requests for interconnection, a transmission provider has an intake process referred to as a queue. The interconnection queue provides for orderly management of requests under a first-come first-served approach, and serves as the basis for assigning cost responsibility to generation developers for transmission upgrades. "Ideally, all generator applications would be processed in a timely manner. However, the queue process can become burdensome particularly if significant transmission upgrades are required for a project. Queue position can have real commercial significance; a long wait in the interconnection queue can have serious consequences for the financial viability of projects, particularly renewable projects if they are dependent on the recently extended federal PTC. Cap-and-trade hasn't worked in Europe.